About 18 months ago, an Amish couple – David and Miriam – moved onto a farm a few miles from our place. Last spring I was at their house just as they finished making maple syrup. “We’ve never made syrup before”, David told me, “ but we read how to do it in a newspaper called Plain Interests.” He gave me a little bowl of syrup to try while he got a copy for me to see. 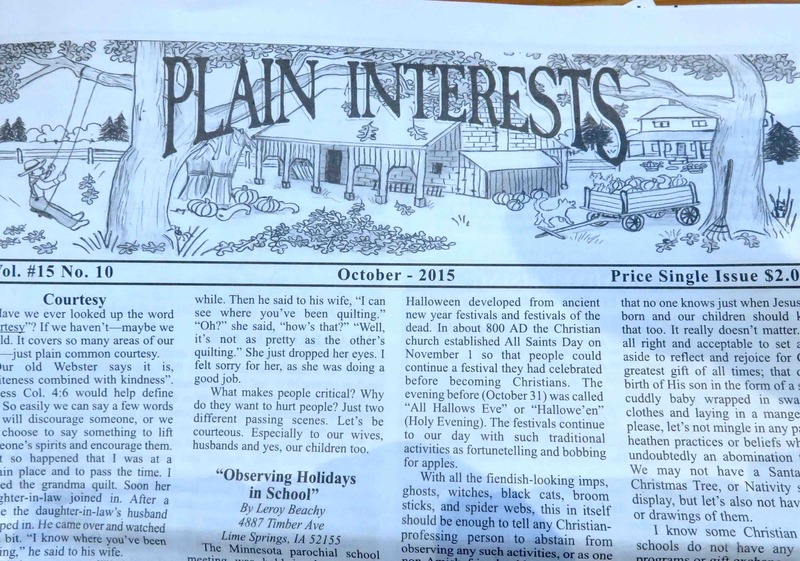 I’d never heard of Plain Interests before, but as he handed me the newspaper I realized something. In a world where most of us have access to way more information than is good for us, David and Miriam choose only to have a very few sources. 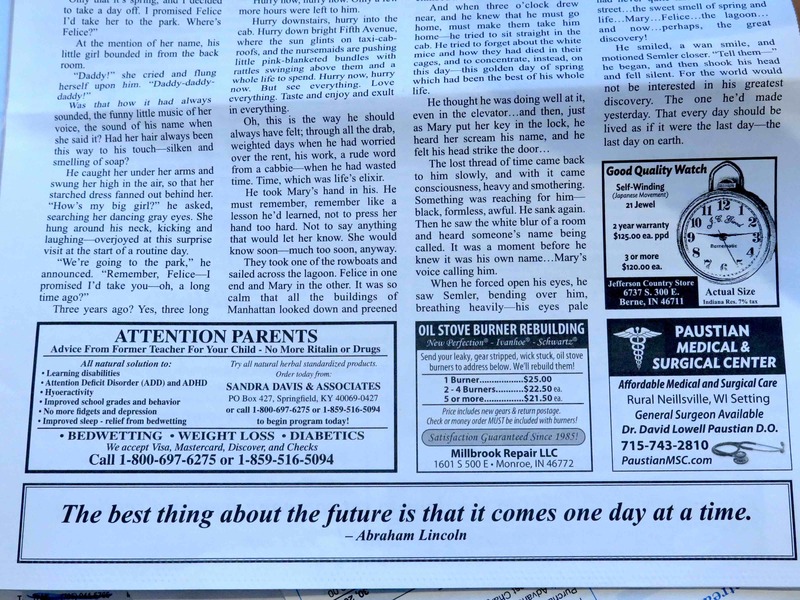 And this simple, printed newspaper was one of them. Plain Interests gets its name from the fact that Amish and Mennonite people aim to be plain. Plain in dress, plain in lifestyle and just plain humble. To most of us in the wider world, “plain” has a slightly negative tone. Perhaps a better way to think of the word in this case is “simple”. Simple lifestyle, simple needs, simply happy with the basics. Although I have no shortage of access to information on how to make maple syrup, grow a garden or any other topic under the sun, I subscribed to Plain Interests just to see what it was like. I’d hoped it would give me a glimpse into the lives of people who have completely sidestepped the usual sorts of annoying and addictive information products that saturate the world these days. I just got my renewal notice for Plain Interests and with half a dozen copies now read before shutting off the light for the night, I’ve found more than I bargained for. Plain Interests is made up of contributions from Plain people everywhere. Articles range from tiny requests for advice on how to raise kids, run a household or deal with a garden, all the way to multi-part recollections of how the Amish locked horns with the federal government over the issue of home schooling in the 1950s, and how some Amish went to jail for it. Although I was introduced to Plain Interests because of an article on making maple syrup, most of the articles are actually about thoughts and ideas and experiences of people living the “plain” life. There are the thoughts of a young mother on how much she likes wash days, and the chance to see the clean clothes of her family blowing on the line outside. And this from a woman whose washing chores probably take her 5x as long as anyone with an automatic front loader and electric tumble dryer. It’s the kind of thing that can only come from a loving heart. There was a very moving story about an Amish man who just happened to be traveling on a road by horse and wagon after a day of work on someone else’s farm when he saw a run-away buggy up ahead. The woman in the driver’s seat had lost the reins and the horse was pulling her and some children out of control into a busy highway intersection. It was the man’s own family . . .
One of my favourite stories was from a woman writing about an old shed on her family farm and how she probably won’t like the new one as much when the old, bent, cracked and “airy” shed finally goes down. Even the advertisements in Plain Interest make me sit up and take notice. They’re different because they’re a window into a world where people understand that technology affects our souls. And just because a technology is effective on one level, doesn’t mean it should be embraced. As you’d expect, there are no web addresses on any of the ads, because Plain people choose not to use computers or the internet. And while there are ads for the usual products you’d expect – big cooking kettles, lantern fuel, “the world’s most comfortable rubber boot”, horse tonic, and a German-English translation of The Ausbund song book, there are ads that surprise me somehow, too. 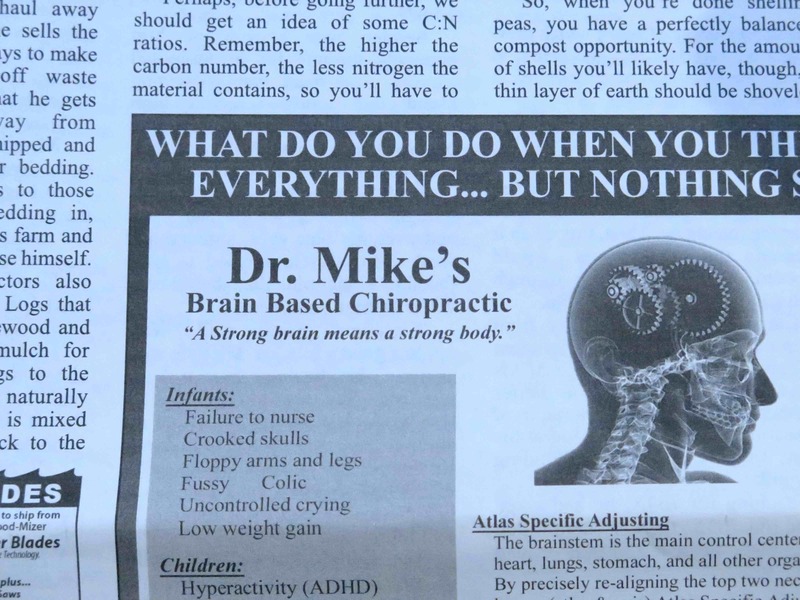 Dr. Mike in Millersburg Pennsylvania is a “brain-based” chiropractor who took out a half-page ad in Plain Interests. There’s also an ad for a herbal bed wetting remedy, Fountain of Life Infection Purge, and Dr. Martin’s “How Toxic Are You” handbook. The whole herbal healing, natural health angle was bigger than I thought with the readership of Plain Interests. I’m not sure why, but this surprises me. As I write this, my copy of Plain Interests is open to a page that has a quote from Abraham Lincoln running along the bottom. “The best thing about the future is that it comes one day at a time”, Mr. Lincoln noted. In a world full of screens that seem intent on having us all live many days at a time, it’s good to remember that real life was never intended to come at us from so many angles.